Mr. Janoski is a zealous litigator who believes that facts win or lose cases. His practice includes litigation, employment, and workers’ compensation. He makes it his duty to know more about the facts of a case than opposing counsel: he knocks on doors, picks up the phone, identifies witnesses and strategically uses facts to consistently drive cases forward. 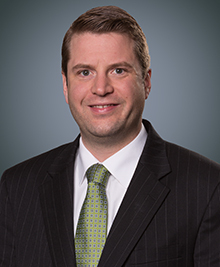 In addition to litigating, Mr. Janoski also works closely with clients in preventive counseling, internal company investigations, and crafting and evaluating businesses’ internal policies and procedures. An avid outdoorsman, Mr. Janoski loves forests and rivers. He, his wife Ellen, and their three children enjoy the Ozarks and the Shenandoah mountains the best. Mr. Janoski and his wife also love politics and would rather watch a good debate or election night returns than the Superbowl.